"Jean Bayard was a wonderful, wonderful woman and I wish there were more like her who cared enough to do something." After earning her Ph.D. in clinical and experimental psychology, Jean-Robert Bayard spent over forty years working as a psychotherapist helping troubled people understand their thoughts and feelings. Her previous works include How to Deal with Your Acting-Up Teenager, a self-help classic for desperate parents with publication in over a dozen countries and several languages. 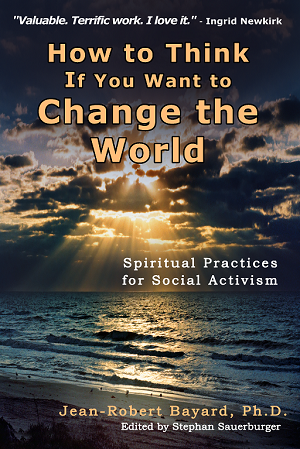 Throughout her career, Dr. Bayard worked tirelessly as a pioneer of modern activism. With a passionate concern for racial equality, she worked in the civil rights movement throughout the seventies by means of marching, newsletters and negotiating with employers to hire blacks, helping to document discrimination by landlords, and even going to jail for sitting in front of a cement truck to protest the refusal of Pittsburgh's labor union to admit blacks to build the United State Steel building. Also determined to ease the suffering of animals at the hands of human beings, she and her beloved husband Robert Bayard, Ph.D. founded and ran a two-thousand-member California legislative network that was instrumental in passing a number of animal rights bills. As one of the originals of the modern animal rights movement, she was arrested twice and went to jail for protesting cruel and unnecessary animal experiments she discovered to be ongoing at Stanford University. She also founded a newsletter for fellow psychologist to garner awareness and support against unnecessary animal research. Always a worker for peace, she was active with Beyond War and also supported various do-good organizations including Childreach, Greenpeace, the International Campaign for Tibet, the Peace Division of the American Psychological Association and the Vanguard Society of People for the Ethical Treatment of Animals. Recognizing no limits in her quest, for over 70 years Dr. Bayard benefited from a variety of spiritual approaches. Having been born into the family of a Dutch Christian Reformed minister, she grew up with an exceptional knowledge of the Bible and love of the teachings of Jesus. At age nineteen she discovered the only book on yoga in the Los Angeles County Public Library and knew almost immediately that this was a path she wanted to follow. Since then she has never stopped studying and contributing to the great Eastern spiritual philosophies, practicing their disciplines in conjunction with Western science, especially via the writings of Sri Aurobindo, the Dalai Lama, and Swami Rama of the Himalayan Institute. Starting in 1963 she underwent 264 hours of intensive training in Hinayana Buddhist meditation at Wat Po in Thailand under the personal supervision of the abbot, and later a several-year intensive course in Tibetan Mahayana Buddhist doctrine, practice, and history at the Nyingma Institute in Berkeley, California. Never relinquishing her persistent focus on the elimination of the suffering of others, she dedicated the last years of her life to writing a series of nonfiction and fiction works for her fellow activists, teaching in the practices how to get what you want by turning what hinders you into tools, taking responsibility for your thoughts and feelings and showing you through self-revelation as well as the example of the great activists of history How to Think If You Want to Change the World.